While for many thoughts of a South African safari inevitably settle on Kruger National Park, it is just one of many world-class game reserves in South Africa. These reserves are found across the country’s many diverse regions, from the Eastern Cape to Kwa Zulu Natal and the Western Cape’s Garden Route. What’s more, these areas are all malaria free – making them ideal for those travelling with children. 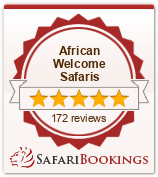 If none of our packages suit you, give the travel experts at African Welcome Safaris a call, and we’ll be happy to put together a custom holiday that suits your budget and requirements.